A quick stir-fry combines classic Mediterranean ingredients into one fabulous dish. Serve with angel hair pasta. This recipe is from Holly Clegg's Trim & Terrific Gulf Coast Favorites: Over 250 easy recipes from my Louisiana Kitchen. In large nonstick skillet, heat olive oil, sauté garlic 30 seconds. Add parsley, oregano, tomatoes, broth. Bring to a boil, reduce heat, simmer 10–12 minutes. Add shrimp, cook several minutes or until shrimp start to turn pink. Stir in spinach, continue cooking until spinach is wilted and shrimp are done, just a few minutes. 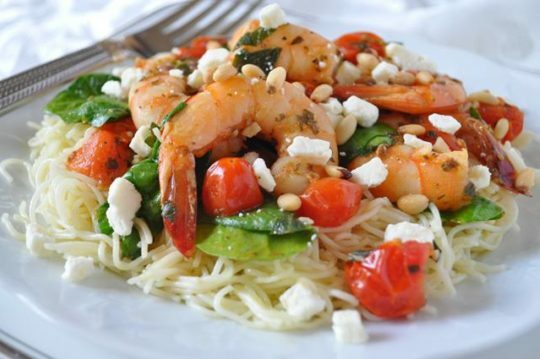 Toss with pine nuts, sprinkle with feta cheese.